Sobia Nazir is a world renowned industries that deals with clothing, bedding, apparels, curtains and sofa stuff since decades. The industries are not dealing just in Pakistan but around the globe with its number one products. Sobia Nazir focuses in producing high-end fabric products made of fine quality materials and owns hi-tech production amenities in fabrics to fulfill all customer demands. The company makes use of the latest expertise to make sure that each product is unique and innovative in style and shows delicate artistry. The company believes in uniqueness as charm & quality as foundation. The empire-building spirit of the industry diligently seeks steady progress, continuous development and outstanding performance. In this successful journey of clothing products since decades The Sobia Nazir has launched number of brands and now she has launched Sobia Nazir Eid Collection 2016 for women. Now it is time to launch SN women lawn collection in the banner of Sobia Nazir. The collection is especially designed by the very talented designers of Pakistan, who managed to make the brand famous around the globe with their amazing work. The collection is consists of classical traditional printed via hi-tech digital machines, fine thread embroidery, very sophisticated single shirt kurtis that can be paired up with tights and chiffon dupatta for elegant looking personality. 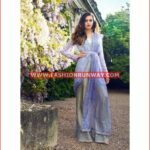 Digitally printed dresses are usually consists of three or four piece suits, with delicate floral or botanic printing, line printing, classical printed and multi mixture patterns etc. these dresses are either with chiffon sleeves and chiffon dupatta or with lawn dupatta. The dresses are customized so you can make it shalwar kameez, trouser shirts or gown shirts. These dresses are ideal for casual everyday wear to beat scorching heat. The next collection is of embroidered range, with fine quality thread and cut work on neckline, border and chiffon sleeves. These dresses are ideal for summer lunch parties, dinner get-togethers, to bring that beautiful confidence. These semi-formal dresses are ideally designed for women who prefer to be in fashion every time every day. Than there comes single shirts, which you can paired up with tights and colourful chunri dupattas to bring that specific chic looks on trendy ladies. The price range starts from RS/- 13,950. 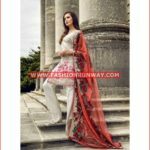 Check below here Sobia Nazir latest embroidered eid dresses 2016 for ladies.